In the second part of our interview with former Liverpool Under-23s coach Micael Beale, we discuss his work at the Reds’ academy and players for the future. * You can read part one of this interview, here. It was a really good four years for you at Liverpool, in particular the last year which has been really impressive one for the academy. I know it was difficult for you to leave, seeing the progress being made. You must have been really pleased to see Harry Wilson get his debut recently? I have been over the moon, looking from the outside and seeing Harry get on and make his debut, that was the end of my time at Liverpool. It was one of the things missing at the end that I hadn’t got Harry there. Harry was in my first training session, my first team. He was someone I won many games with and had so much enjoyment working with and been close to. This year it was my plan, after such a disappointing year last year, to make him captain. I wanted to show everyone he was a responsible boy and he had been at Liverpool the longest out of the current reserve team group and I wanted to promote him upwards. Just because he is small doesn’t mean he is not a player that you can’t count on or rely on and I wanted to try and push him forward. Harry has responded to that fantastically well, god knows how many goals and assist he has this year but numbers are very high. All credit to him. So far he hasn’t suffered any injuries this year and he gets it make his debut. I was so, so proud. After the parents, its the coaches that have worked with a player over the years that are proud. We have had a lot of moments like that in the last two and a half years, we have been have blessed because a youth coach can go 10 years not having what we had in 10 months. I am very thankful to the first team staff for that but at the same time I am more thankful to the players because if they are not good enough or out training well alongside the first team guys then there is no way Jurgen would play them. He is a manager that is used to working with players in the Champions League, top young players like Marco Reus and Mario Goetze at his former club. If these boys weren’t good enough to play there is no way Jurgen would play them. It must have been pleasing to see Trent Alexander-Arnold get his first league start at Old Trafford? It was only a year ago that I made the dreadful mistake of playing him at Anfield in an Under 23s game, where it didn’t go so well for him. We came home at the end of that day thinking we need to give him more time, because he has a huge talent you just think they are just going to be able to play the game and not make any mistakes. That day he probably learnt a lot and it was very tough to play against Brendan Barker who had a very good game for Man City that day. I know that hurt Trent, but what a resilience he has shown, within about four months he had turned around from that and was playing in our first team. To go and play like he did at Old Trafford was fantastic, I think it’s lovely that it was so similar to what had happened with Rob Jones. Rob Jones is really an unsung hero of the academy and is a good friend of mine. He is such a lovely man and he is there every step of the way for these guys with advice and guidance off the pitch and him to share something like that with Trent, making his full debut for Liverpool at Old Trafford is very unique and I was really pleased for Rob as well as for Trent because, it shows everyone is working together. Rob, Steve McManaman and Robbie Fowler all came back to the academy and had a role mentoring. How did it go? Was it valuable to the players? Did they respond? If you ever get chance to meet one of your idols, you want them to be as nice a person as you love them as a player on the pitch, it’s not always the case but with them guys it was 100 percent. It was hard to tell Macca he was one of my idols as a kid because now you work with him as a grown man you don’t want to come across as being a bit soppy but these people are fantastic. I took a meal with Rob Jones and Steve McManaman before I left. They took the time to have lunch with me, Robbie Fowler sent me messages and the king Kenny came to see me. Wow, he takes your breath away for the icon that he is but the man he is as well. Kenny Dalglish is up there with anyone with the highest respect. Their work at the academy is very important. As it has been highlighted, we don’t share the same training ground as the first team and Alex Inglethorpe has been fantastic at bringing these people back and I think it takes a very intelligent man and confident man to bring these icons back into the club with no worry and the only thing he is worried about is the development of the players. It’s been a pleasure for me to know them, I was delighted to be involved with the idea of asking Steven [Gerrard] to come back and something I was greatly excited about and I wanted him to work closely with me because I know what he can offer. I repeat that Alex deserves big praise for that, there’s too many people in football and other industries that are happy to not do things like that and keeping themselves as king. All he wants is to develop the players and these guys come in and they don’t coach, Steven is going to coach, but they are around the session adding some support and I think that’s fantastic. They give up time very freely but they have their own families and work commitments elsewhere. It just feels like a family, its the easiest way to put it. Chelsea was a different experience for me and it never had that feel. Every time one of the players gets through it’s really celebrated, everyone is jumping up and down celebrating. But then the next day we work hard. It’s not a case of resting on our laurels; we celebrate the moment and then we move forward the next day. 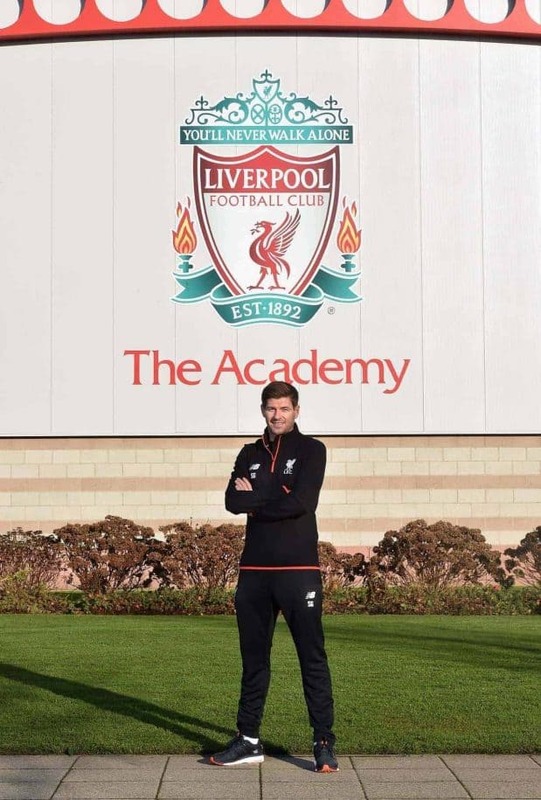 How do you see Steven Gerard’s role at the academy? What sort of impact do you think it might have on a 14-15-year-old player that has Gerrard coaching him for a session or two? I think it’s fantastic for everyone. Firstly for the players its a huge inspiration a lot of them would have grown up as Gerrard as their idol and to see he is an honest person that’s just like that coming from the same area as them, working hard like them. He can give them advice both on the pitch and off the pitch because he’s lots to give to these young players and Steven would have had to manage that situation as well so can give them advice about life. Think of all the life experience he has had travelling with England and Liverpool, playing in big games against big opponents. He can talk about all of that and he can break the game down as well. I think it’s very, very exciting for the players. I think for Steven it is perfect. I think a lot of ex-players rush and probably get other people around them to fill the gaps in, they go to be a manager and take people they know who are coaches to fill the gaps, what Steven is doing should be applauded because he actually a player that’s going back to working with young players and doesn’t want to skip anything and wants to tread the same path as a coach as he did as a player. I think thats absolutely fantastic and speaks volumes for him as a person. It would have been a lot easier for him to take a first team job and try to just do well but he has really thought it out. I think it’s lovely that he has got some ex-teammates around him – Tom Culshaw, Mike Garrett, Michael Yates. These people actually played with him when he was coming through the academy, Ian Dunbavin. They were all with him when he was coming through so he is working with friends rather than colleagues so he will learn from his friends. So the information and the conversations and the learning is much freer. Let’s not forget Steve Heighway is there who was his mentor as a player as well. So for Steven the opportunity is great for him to learn from these people. For the club I think it’s important; he is a Liverpool boy, he gave so much to the club and the club gave so much to him and in this agreement I think it will be the same now. Nobody is making any predication on “will he be manager?” Who knows, he may want to be like Steve Heighway and be head of youth. For me, the doors to Liverpool academy should always have been open to Steven and I applaud the people for making sure they were. I am just jealous I am not there to work alongside him and to help him and for him to help me because it would be fantastic. There was an interview with Klopp recently and he stated there was a “special kid”, perhaps in the U16s/U18s, do you have any idea who that might be? There’s three or four, I don’t want to upset the other three by only naming one and I also don’t want to put the academy staff or the boys parents under pressure. A year ago, if he had said there was a special one going through the academy then no one would know who that is now because you could have said it was Ovie [Ejaria], was it Trent, was it Ben [Woodburn], was it Harry Wilson. I think there’s a lot of good players, but each player has got to be given his own time and development. They are not all ready at the same time. The prime example of that is seeing Ryan Kent, Sheyi Ojo and Harry Wilson excite us for the last few years and Sheyi got there first then Ryan and Ovie and Harry came slightly later. It’s all about when you are ready rather than being rushed. The hope is that these boys, its not how quick you get there, its how long you stay there. Rhian Brewster started for the first time for the U23s recently – can you tell us about his game? His style of play? I’ve know Rhian since he was five/six years old. I remember the first time I saw him it was at Redbridge leisure centre of The Only Way Is Essex fame, that sort of area of London. I went across on a Monday evening with another coach and scout and we ran a little development programme and Rhian came with his team and we took four players that night into Chelsea. Three of them are still there and are FA Youth Cup winners. Rhian I kept in touch with. His dad, Ian, has always been a huge Liverpool fan, there’s not a bigger Liverpool fan in the south. Whenever they play, he is always on the phone and texting about the U23s or the first team, he is a crazy Liverpool fan. The opportunity for him and his son, as a Liverpool fan, to come to Liverpool at 14 was fantastic and it’s lovely for me to see him developing. I have known him for over 10 years now, I feel a little guilty that I wasn’t there to work with him day-in and day-out but I am still very close to them as a family and Rhian just needs time. If you look at him he is very lean and very much like Trent but two years younger. Very lean and needs time to fill out but he is very quick and scores lots of different types of goals. His finishing is excellent and very clinical and calm. He is not just a number 9, he can play 10 or on the sides and be equally effective. I think he has an outstanding future. However, he needs time as he has just turned 17 last month. It’s not a time to rush, and again if you look at his body shape to Ben Woodburn, they are different 17 years old thats for sure. This is not “oh he is 17 and Ben did this, so we should push Rhian forward,” I think all the players need to take their time and their own paths. Do you have any intention to build a relationship between Liverpool and Sao Paulo? Could it be that you recommend a player to Liverpool? I would definitely recommend a player to Liverpool, other than any one else, that’s for sure. I know Liverpool have their own scouts in South America, they are people that I’ve worked with in the past, with players coming in – like Allan Rodriguez. For sure if they wanted an opinion on a player at another club and asked for that opinion then I would be very honest with them. There is a lot of talent in Brazil, it is a very competitive market. All the big clubs in Europe are looking at young players in Brazil. My working relationship with Alex and Pepijn and is so strong that of course if they asked for my advice I would be there for them, but in terms of a formal link it’s difficult. Sao Paulo are not a smaller club then Liverpool, they have a 67,000 seater stadium and have won the World Club championships three times. Both clubs are huge in their own right but certainly in terms of advice on players from Europe I would give to Sao Paulo and vice versa for Liverpool. 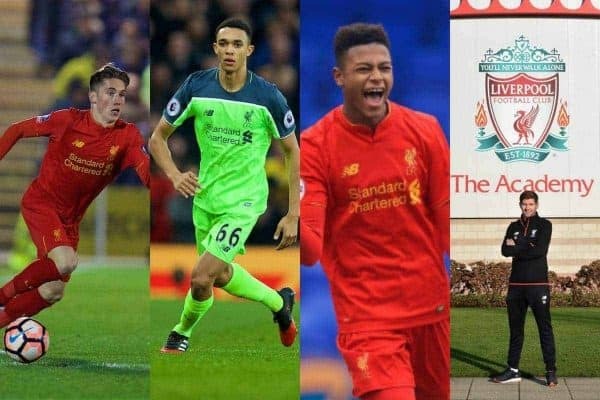 We were talking earlier about Melwood and the academy not being on the same site – how beneficial do you think that will be in bringing players through and integrating them to be in the first team? I think there’s been a lot of measures in place to make it as close as it can be. Sometimes you can have 20 meters but if the first team staff are not interested in the academy then that can feel like 20 miles. The small drive from Melwood to the academy doesn’t seem big because the two managers I worked under were genuinely interested in developing the young players and also Alex has been very good at bringing in ex-players/managers to make sure they are mentored and make sure they have big brothers or dads around. It’s much easier if you are on the same site though. The U23 players aren’t the oldest players, the oldest players are the first team players. If the first team players drive the behaviours and the standards then it brings up the young players very easy. In time the club deserve to have the one facility and everything that comes with it. Things like trying to implement the style of the first team manager into the first team and dripping down to the other teams would be much quicker if you are on the same site. Communication would not be over the phone, it would be face to face – and in any walk of life were you can have a face to face conversation it is better than over the phone because you can completely understand by reading the facial expressions or seeing the person face to face what they mean. I think Pepijn going to the first team and being a bridge between Alex, myself and the younger coaches was a masterstroke too. I think the owners to accept that idea and make that idea a reality was a big step to building the bridge. As I said I’ve worked at a previous club where there was 10 meters between the two and it felt like it was ten miles! * Read part one of this interview, here.